If touch functionality still is not working correctly, calibrate the screen. In Windows, search for and open Tablet PC Settings. Tablet PC Settings window opens. On the Display tab, click Calibrate. 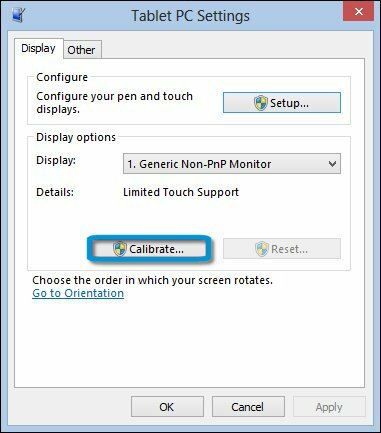 Follow the on-screen directions to calibrate your screen. Click Yes when prompted to save calibration data. 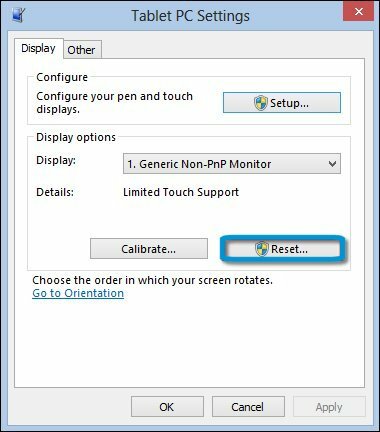 If the screen is still not calibrated correctly, undo the calibration by clicking Reset on Tablet PC Settings. When prompted, click Yes to allow the Microsoft Digitizer Calibration Tool to make changes to your computer. The Digitizer Calibration Tool window opens to confirm that the calibration data was successfully removed.